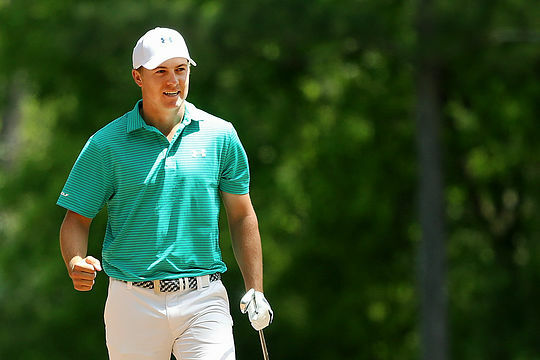 Reigning champion Jordan Spieth has seized a two-shot lead after the opening round of the Masters in Augusta. Spieth fired a six-under-par 66 early on day one to storm to the top the leaderboard two shots clear of New Zealand’s Danny Lee and Irishman Shane Lowry and en-route to become only the fourth player to claim back-to-back Masters victories. “I would have signed for two-under today and not even played the round, knowing the conditions that were coming up,” said the 22-year-old Spieth, who is aiming to emulate Jack Nicklaus, Nick Faldo and Tiger Woods with consecutive Green Jackets. Englishmen Justin Rose, Paul Casey and Ian Poulter, Dane Soren Kjeldsen and Spaniard Sergio Garcia share a tie for 4th position after opening with rounds of 69. Jason Day, who had entered the tournament in sensational form, winning six times in his last 13 starts, got to five-under in his first nine holes before dropping five shots across his last four holes for a 72. The world number one bogeyed the par 5, 15th and then backed that up with a triple-bogey 6 at the par 3, 16th after putting his tee shot in the water. A bogey-par finish left Day six strokes adrift of Spieth. “Today when I wasn’t on the perfect number, I wasn’t sharp enough with my iron play. That was leaving me too much work to do on the greens, probably two of the putts that I had, were not two putt-able,” said Scott. The rest of Australia’s green jacket campaign has started slowly with 2013 Masters champion Adam Scott shooting4-over-76, leaving him 10 shots off the lead. Marc Leishman and Masters rookie Cameron Smith finished the day with rounds of 74, while Steven Bowditch struggled with a wrist injury to shoot a 7-over-79.